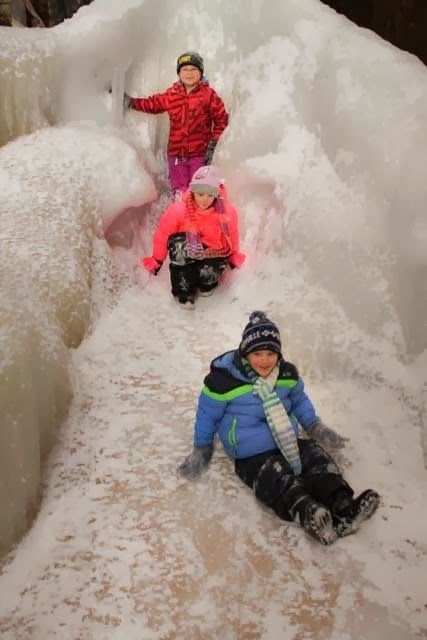 Stranded in Chaos: Ice Caves- CONQUERED. 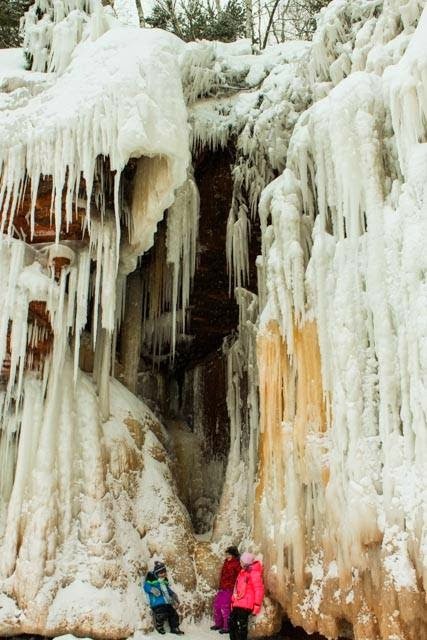 Ever since the ill fated trip in a kayak to the sea caves of Bayfield, Wisconsin, I have always thought of maybe hiking out there in the winter. But ever since then, the caves have not been open in the winter. Mostly because it just hasn't been cold enough for a long enough period of time for Lake Superior to freeze over enough to allow traffic on it. And you can see from my pictures in the above linked post that we never got to go into the sea caves. Matt and I, in summary, make a really terrible team who should never, ever kayak together. We couldn't get it together enough to go into them. But they were lovely from the outside. This year I am determined to be far more active. Which means doing stuff in the winter though I hate the cold, snow, and ice. I also am not equipped for the cold, snow and ice. I now have a winter jacket thanks to a really amazing blog friend, but I do not have snow pants or winter boots that are function over fashion. Their cuteness does not make up for the fact that they do nothing to keep my toes from literally falling off. But this year is the first year since 2009 that the caves have been open. We missed going on a really "warm" weekend when it was hovering around 28 degrees (it was practically spring that day! ), but instead, we went the weekend after. It was 6 degrees when our asses got out of the car. But, we bundled up. And by "bundle up" I mean Matt gave me a pair of his snow pants to put on over my base layer pants and my jeans. To say they were snug is a ridiculous understatement. I have never in my life felt more like a sausage link than I did at that moment. Quite possibly, the best picture of us ever. 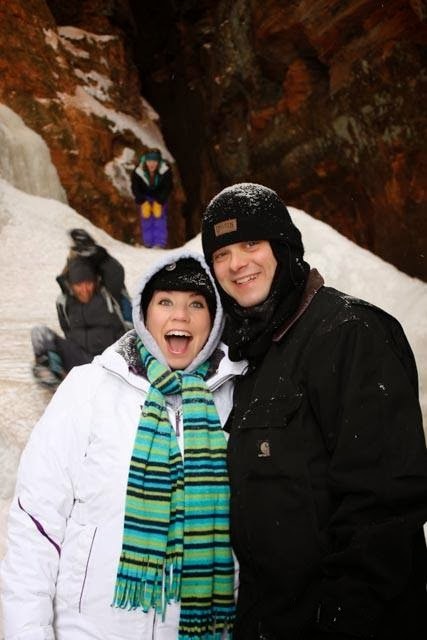 I like this one because look- we are walking on a frozen lake. For those who have never seen it, Lake Superior is huge. So huge that you could mistake it for the ocean. It really looks like we are living on the ocean here. So this? This is terrifying. I have a fear of ice, and hearing all of the cracking of the ice? There were moments that my pants were at real risk of becoming wet. We went with our friends Amber, Jeremy and Kennedy. 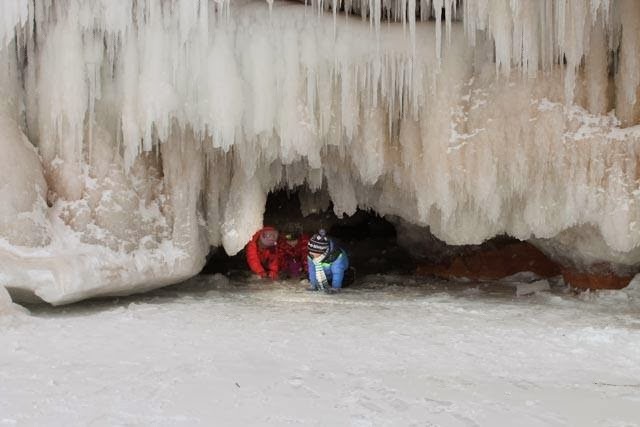 Seeing the three kids climb under, through, and around ice caves was definitely very fun. I'm pretty excited they get opportunities like this. Sliding down a huge ice hill that almost looked like a frozen wave when you stood back. The caves are so tall in spots, it's kind of amazing to know a lake carved this all out. Matt even crawled through some of the caves with them because in some, I got paranoid of someone getting hurt or stuck. 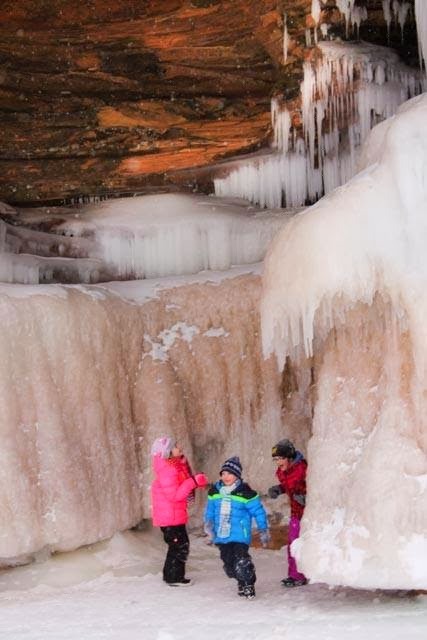 I absolutely love this picture of the kids sitting in a weird ice hole. You can't tell, but Jackson is wielding an ice sword. He said he was an ice pirate and was really disappointed when I told him if he took the icicle home it would just melt in the car. But what was super cool was that there were some of the neatest icicles I've ever seen. So I took one for the team and got a couple of pictures while laying on my back. Which is a little terrifying because they could fall on your face and all. Thankfully, no blood was shed on our Sunday adventure. Can I just say how proud of me I was? Because not only did I hike it out there but I did it in the winter. I can count how many things I have done in the winter on one hand. It was pretty big. The kids already said if we can go back next year we should. This was right when we had decided that we were going to turn around. Which was a good thing because the walk back? Completely brutal. By that time, the temperature had dropped, the wind had picked up significantly so we were walking into the wind the entire time. I now understand the importance of face masks. By the time we got back to the parking lot we all had icicles on our eye lashes, Matt was the only one without a completely red forehead, and I couldn't feel my toes. Matt had all of his winter gear on and I'm really glad I thought to at least grab scarves because that's what the kids and I used to cover as much of our face as we could. So that picture above? Is us before we turned around. This picture? Is us after the three mile hike back. In which at some point shortly after we started back, I basically fell into a hole. Or rather, my right foot sunk into a hole. It didn't hurt, I was able to walk back without a problem. Fast forward two weeks and that ankle? Is in so much pain I can barely walk at this point. I'm going to the doctor tomorrow for other things so I guess I'll add my bum foot to that list. And finally, Matt and I before getting into the car. AT this point, my face hurt so bad and his was toast warm since he had his swanky face mask and hat I got him for Christmas. Thank god I thought to grab a hooded sweatshirt before we left home because I'm fairly certain that hood was the only thing keeping me from getting frostbite on my ears. So that was it. 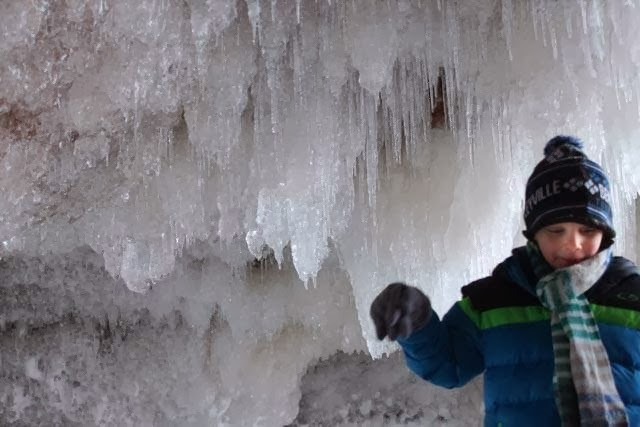 That was out super fun family ice cave adventure. 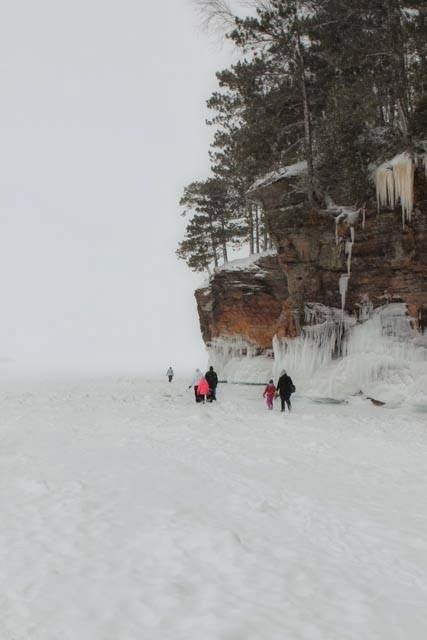 The plan this summer is to take the kids on a boat tour of the Apostle Islands mostly because I want to see them all, but I'll bring them and call it family fun. Actually, this summer is shaping up to be a pretty awesome one for sight seeing, so stay tuned. That looks so fun!!!! I'm not great at getting out in the winter either. We bought a membership to the aquarium - which is indoors! That is amazing! Being from Texas we don't have anything like that - those pictures are beautiful and it looks like y'all made some really great family memories. I hope your ankle gets better ASAP. That stuff is no joke.I stressed (not fractured or anything) my ankle and had to wear a boot for like 2 weeks a couple years ago and I don't even know WHAT I did but it was really annoying. Looks great! The news has been mentioning the caves, but your pictures are better than what they showed. Hope your ankle is OK. Sounds like a fun trip. I know you don't like the cold, but I now live in Virginia and I miss the cold winters. Crazy I know. It's so beautiful but OMG so cold. I've never been in "cold" that cold before. We've gotten down to the teens here a few times and that's too freaking cold! That looks so awesome! I love it when I do one activity that is fun and it makes me want to do more. Phlegm for days and I might start hooking.